Few people understand that, when cooking meat, getting the temperature and the cooking time is more crucial than choosing the right herbs and spices. That is because meat can be quite tasty on its own as long as you do not undercook it and you do not cook it until it’s dry either. It is equally important to have an oven that will cook evenly and that can be an expensive thing to buy unless you go for a simple electric roaster. They are a lot more functional than you would expect, and their cooking time for various types of meets and various weights comes in the package with the oven. That is why we went in search for the top 10 best electric roasters. We have highlighted their most important features in the table below, but if you want to get an in-depth review for each one, scroll past the table and find the model that interests you. As far as the features you should look for on an electric oven are concerned the Oster CKSTRS23-SB is pretty much the standard against all other electric roasters should be measured against. 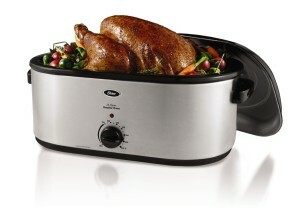 It has a huge 22 pound capacity, which basically means you can fit anything up to the size of a 22 pound turkey in it. Once the cooking is done you can lift the turkey out of the oven using the removable rack the oven comes with. The inside of the oven is made from enamel on steel which has several advantages. For one, enamel distributes the heat evenly over the entire surface of the oven. And second, enamel is the new Teflon, meaning it is extra easy to clean and food does not stick to it. Finally, you can choose to buy the Oster CKSTRS23-SB with a basting lid, which we really think is worth the extra few dollars, since it creates an extremely rich, moist roast. 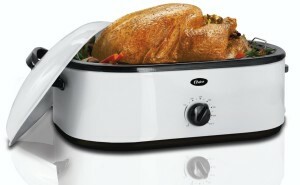 The Rival Roaster Oven has the same features as the Oster, except that you do not have the option of a self basting lid. However, you do have the choice between a 22 pounds and an 18 pounds electric oven, the latter being somewhat cheaper. In fact the most important reason why we featured the Rival Roaster Oven so prominently on our list is because it has everything you would want from an electric oven but for a very reasonable price. You can even choose between a black and a white version, regardless of the size, and for the same price. The first thing we are going to say about the Hamilton Beach 32229 is that it has earned the highest Amazon rating, a 4.6 stars one, from more than 270 customers. 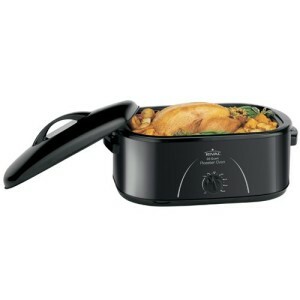 It has a 22 pound capacity and you can choose your preferred cooking temperature to up to 450 degrees. It has a modern stainless steel body, with a simple black knob that allows you to choose the temperature. However, the thing that most impressed us about it was just how good the recipes that come with the Hamilton Beach 32229 actually are. We tried both a chicken and turkey roast recipe and they both came out exceptionally tasty. 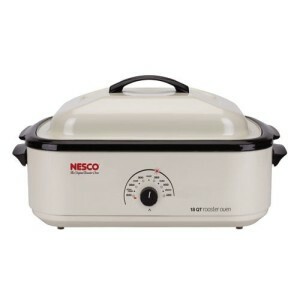 The Nesco Classic Roaster Oven is the first highly affordable electric oven that we are going to feature in our list. It has a smaller, 18 pounds capacity, which should still fit most Thanksgiving Day turkeys, and even the biggest chicken you can find. 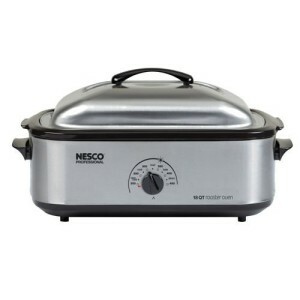 However, the most impressive thing about the Nesco Classic Roaster Oven is the fact that it is very affordable and yet it comes with its own self basting lid. It has several other impressive features like the internal porcelain well that perfectly distributes the heat around the roast and the fact that they use a “Circle of Heat” heating element to further ensure that you are evenly cooking the roast. 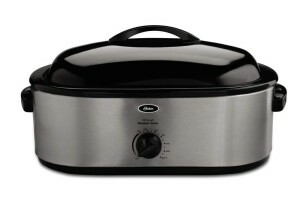 In fact this is also the perfect electric roaster to use if you plan to bake any type of bread or cake. 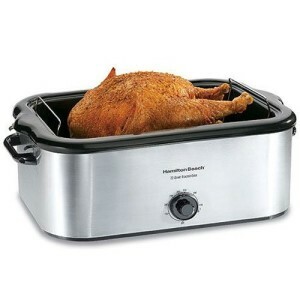 The Oster CKSTRS71 is also an 18 pounds electric roaster that you can get for peanut money, while still enjoying the fact that you are getting an Oster product. It comes with 3 smaller enamel on steel pans and lids that you can use to roast your vegetables, broccoli, potatoes, even beans, at the same time, while your turkey roast is taking shape in the gas oven. Unfortunately, you do not get a self basting lid option with this one, but the Oster CKSTRS71 has earned a very impressive 4.4 star rating on Amazon from almost 100 customers. We absolutely had to feature the Proctor Silex 32700 because it is the smallest electric roaster on the market today. 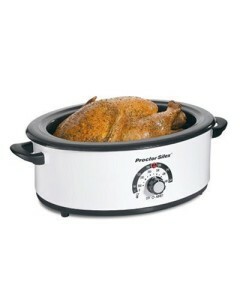 It has a 6.5 pounds capacity, which means it will fit a small turkey or an average sized chicken. Of course that can is not necessarily a positive quality for the Proctor Silex 32700, until you realize that its size means this is the only portable electric roaster on the market. And its perfect temperature handling, and enamel coated cooking vessel, have earned it a 4.6 star rating on Amazon, albeit from only 40 customers. 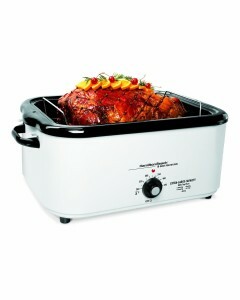 The Oster CKSTROSMK18 is a slightly smaller electric roaster, it only fits a 20 pound turkey, but it can also work as a smoker. Of course, if you are a fan of smoking meat you should check out our top 10 best electric smokers of list, but if you want a machine that will do both, the Oster CKSTROSMK18 is your only option. It is actually a standard 22 pound Oster electric roaster, but they have changed the shape of the roasting pan to include a pair of smocking pockets that you can fill with wood chips. The very point of an electric roaster, for most people, is to have a secondary oven to use while your regular oven is in use, and, by the way, if you are also looking for one of those make sure to check out our top 10 best gas ranges of list. The Oster 18-Quart Roaster Oven is the perfect companion for anyone of those ranges because it also comes with a buffet server with 3 enamel on steel pans. That means you can cook the turkey in your regular oven, and cook the side vegetables like your carrots or potatoes in the electric roaster. We have already talked about the attractive price and interesting features of the Nesco 4818-14, but with that mode you only got the choice between white and black. So we decided to also feature the Nesco 4818-25PR, which is basically the same oven, same volume, same features, but in a more modern brushed aluminum look. 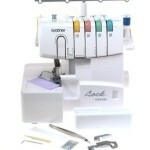 Finally, we decided that it would not be fair to you, if we did not introduce the Hamilton Beach 32182. 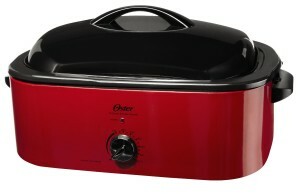 It has the same buffet server with 3 steel pans feature that the Oster 18 Quart has. It even has the same 18 quart volume. 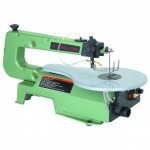 We were impressed by the quality of both these products so it is really up to you to choose which one you visually like the most.